Perfect for extra visual sensory input. 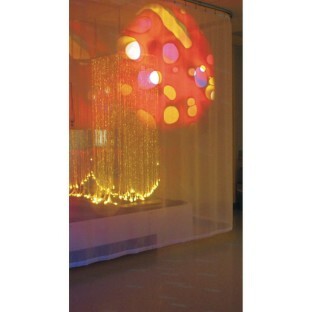 It’s a sheer curtain that allows the projector image to appear on and through the curtain. Allows user to actually touch the images without casting a shadow. Calming colors create a lovely ambiance making it an excellent addition to sensory environments and perfect for those who need extra visual sensory input. The curtain measures 7’ tall x 8’ wide and includes 8’ of straight track to be mounted in the ceiling.